Founded in 2003, Manifesta Journal is an international journal that focuses on the practices and theories of contemporary curating. 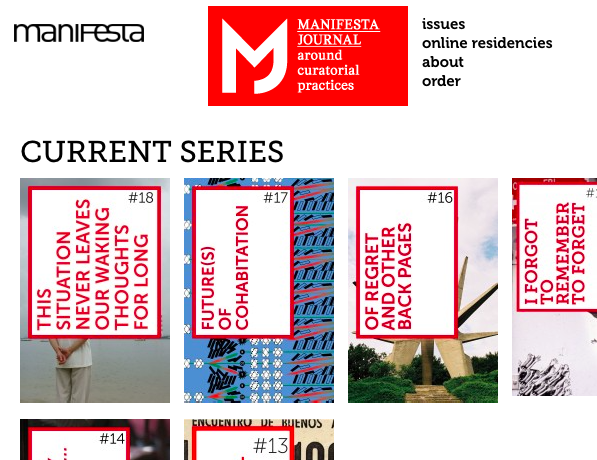 Manifesta Journal is an independent project, initiated by the Manifesta Foundation. The format of Manifesta Journal (MJ), like the Manifesta biennial, is a changing model. It aims to be both self-reflective and critical toward international curating and biennials in general, but also toward its own functional mechanisms. Every six editions, a new editorial team from diverse areas of Europe and beyond is invited to develop a different concept for the series, to reflect on contemporary Europe and the world. A comprehensive grammar and manual for contemporary curatorship was established in the first six issues of Manifesta Journal, MJ #1–6, by Viktor Misiano and Igor Zabel. This continued in the series of six issues that were realized between 2009–2011 by Viktor Misiano, Nathalie Zonnenberg (Senior Editor) and Filipa Ramos (Associate Editor). The editorial work of the Manifesta Journal #13–18, has been taken over by Nataša Petrešin-Bachelez (Chief Editor), Virginie Bobin (Associate Editor MJ #13 – 17) and Lisa Mazza (Associate Editor MJ #18).